My chickens have a very good life. For most of the year, they free-range and feast on fresh grass and all that nature offers. At night they roost in a comfortable hen house; solid and insulated. When they wake in the morning, there's room for the entire community of hens, roosters, and chickens to stretch their legs—and wings—in a very long chicken run covered with netting, until such time as I unlock the gate and let them free. I imagine it must have been a most unwelcome surprise for my poultry when they discovered I'd accidentally locked a hawk in their chicken run for a night! Here's how they all survived (the chickens and the hawk). 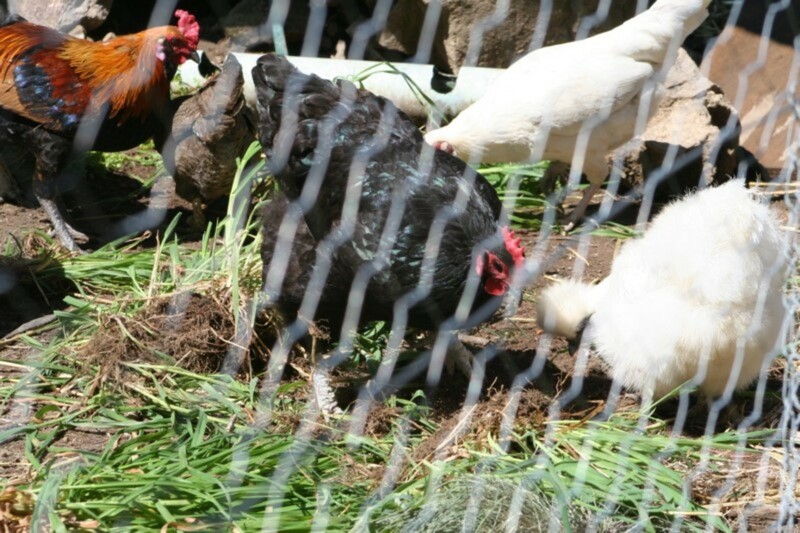 Even while enclosed in their yard, my poultry have access to fresh water and herbs, as well as spots specially designed to provide invigorating dust baths. 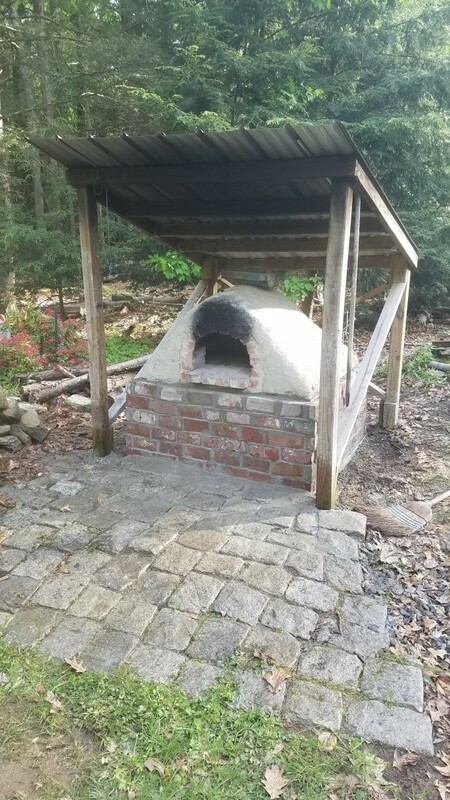 When my husband constructed this most recent hen house, we considered all the potential problems and created a design to keep the adult hens and roosters, as well as any baby chicks, safe and comfortable. For most of the year, we let the poultry free-range. It is only in the early springtime when we need our small vegetables to become established without being destroyed by chickens that we keep them locked in their yard area all day. We built their new safe chicken run and hen house in time for spring. When they moved in, the ground was covered with grass—which they quickly ate. The photo shows what the area looked like when the poultry had been in the run just long enough to eat all the grass, while I was planting herbs for snacks, shade, and shelter from winds. 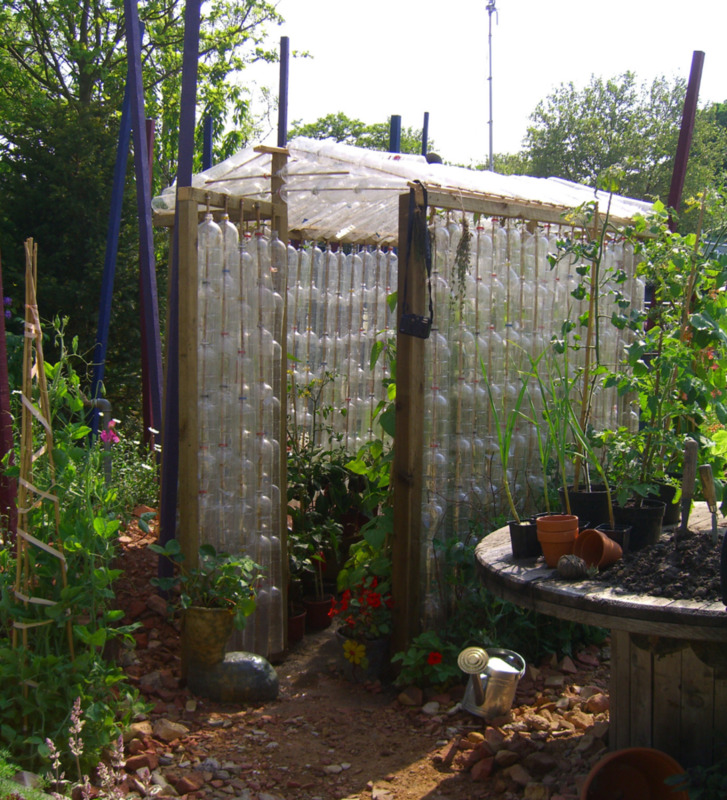 The chicken wire in the front of the photo was about to be used to create protected garden areas, allowing them to peck fresh foliage without scratching up the roots of the plants. 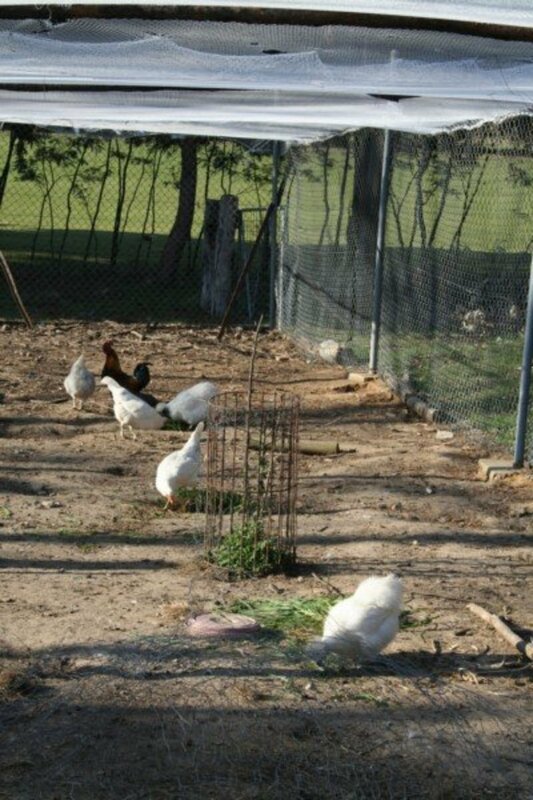 As you can see, even when the ground is bare, I toss fresh green grass into their chicken run throughout the day. Poultry love fresh greens. 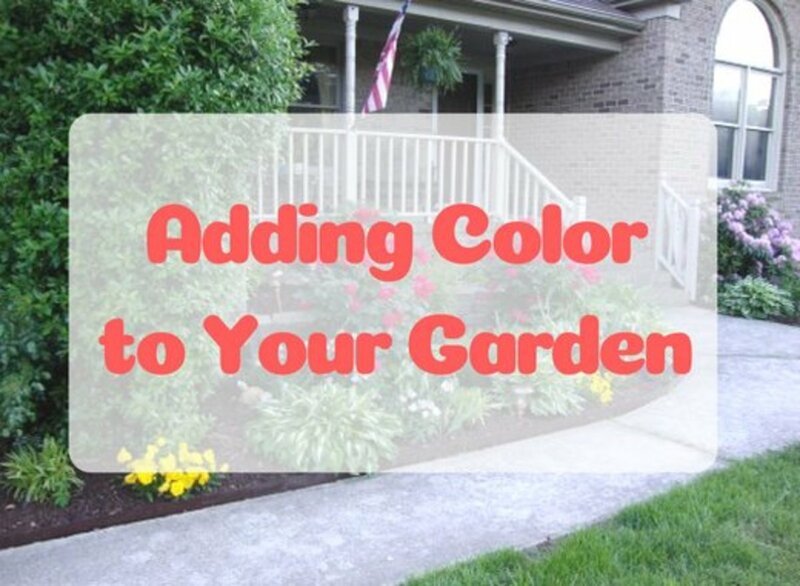 If you feed your hens seeds and grain, be sure to add fresh greenery as well. I transplanted a range of healthy foods to grow in the chicken's yard. The biggest challenge is ensuring the roots of the plants are protected from scratching. 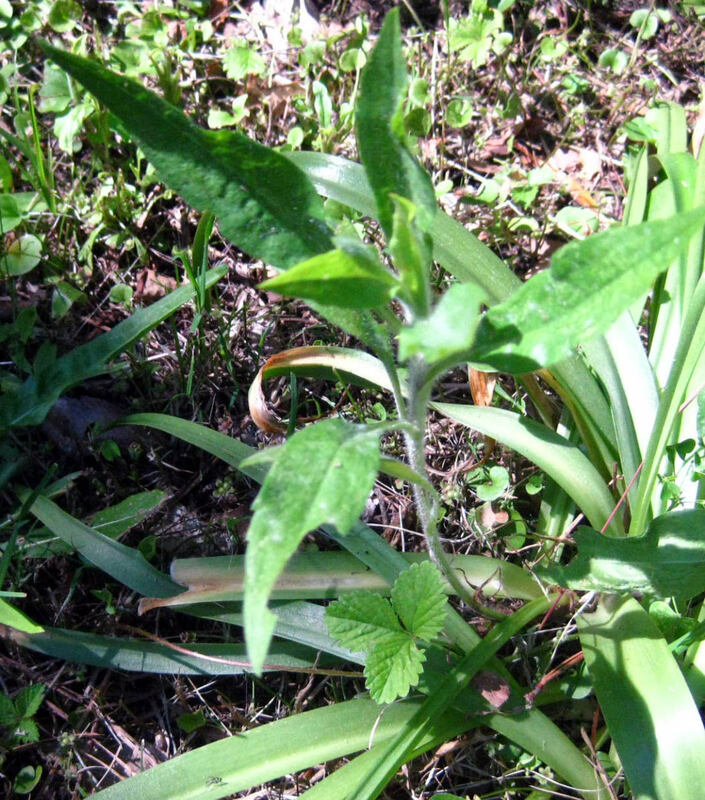 As herbs and other plants grow, their leaves extend outside the protective framework. I choose herbs with medicinal qualities for the hens to snack on, including those that are good for killing intestinal worms, and strong plants to offer shade and wind protection, like globe artichokes. Chinese mugwort (a.k.a tree mugwort) shown in the photo below is one of the herbs now so tall it reaches the netting "roof" of the chicken run. It is the same plant shown in my yard photo above. I have often been asked, "How old does a chicken have to be to free-range?" I believe nature is a great teacher, so I let my chicks wander on the grass and eat as soon as their little legs will carry them. Chicks that hatch when my hens are let out every day, accompany their mothers as they graze. 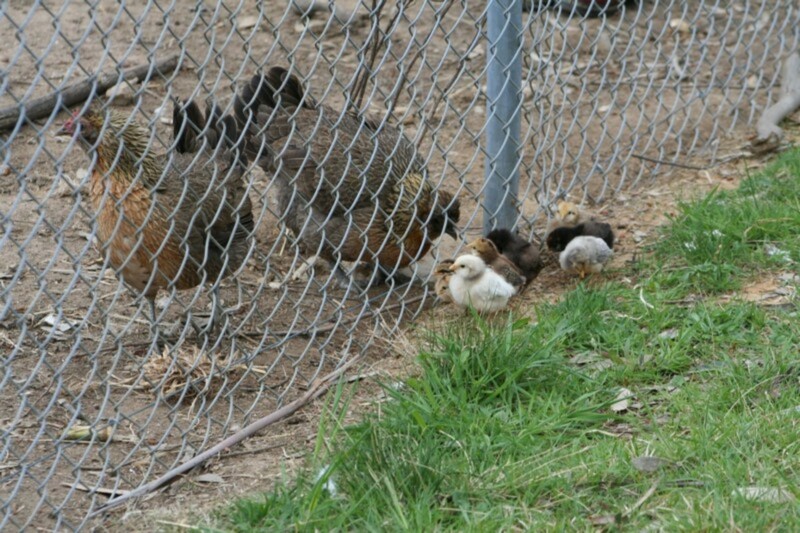 Even chicks who start life in early spring while the girls are confined to the chicken run can wander through the fence and out onto green grass. I took the photo below on the first day of adventure for a group of little chicks. They stayed close to their mothers, but slipped through the fence. It doesn't take long for them to start eating grass freely. They watch their mothers stretch their heads out through the fence for a snack, and copy them pecking the grass. The bare stretch of ground outside the fence shows the distance a hen can reach through the fence. We have lots of birds of prey in our region. 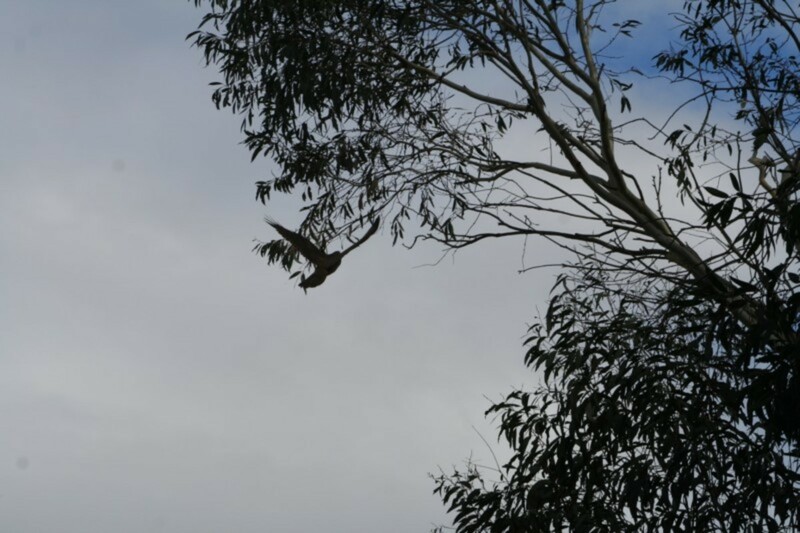 Eagles and hawks nest in the tall trees in bushland adjoining our home. Birds of prey have a convenient water source in the creek that winds past our land, and a smorgasbord of fresh food. Rabbits running across the grass are an appetizing target. Many homes keep free-range chickens, and quite a few farmers lose the occasional lamb. The netting that covers the top of my chicken run is to keep the hens and roosters in, as much as it is intended to keep birds of prey out. My hens and roosters all fly extremely well. Keeping birds of prey away from my chickens is not something I concern myself with too much. I love watching majestic birds in the sky, and I understand they need to eat. If a hawk or eagle is circling above my garden, the chickens generally hide beneath bushes, between the corn, or under a raised water tank. It is fascinating to watch how they alert each other to potential danger. But to suddenly discover they were sharing their private space with a bird of prey must have been extremely unsettling for them. They had limited options available. Brown Goshawks are among the raptors in my region. 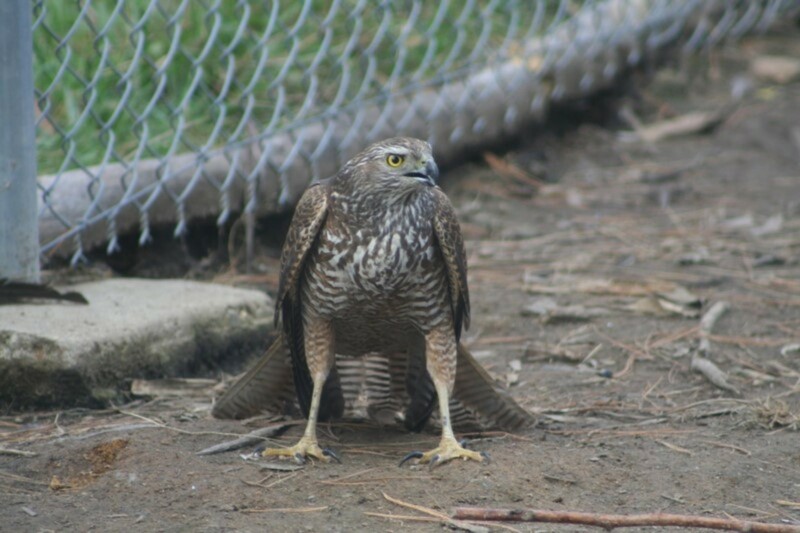 The Brown Goshawk commonly feeds on rabbits and small birds. In addition to small mammals, this hawk also eats reptiles and insects. I'm told they can also be sometimes seen feeding on dead wombats and kangaroos on the roadside, although I've never noticed it. 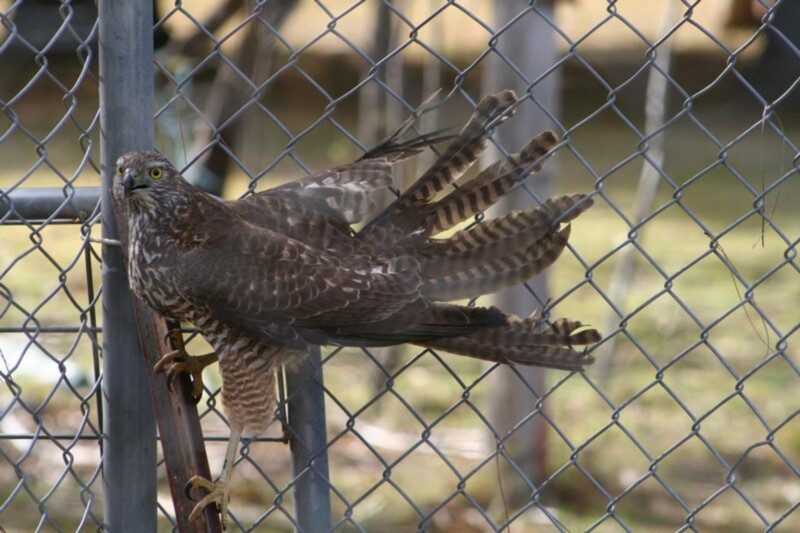 When I entered the chook run to take photos of the captive hawk, I was uncertain of its identity. Had I recognized it, I probably would have just let it go free. But how could I tell the story of locking a hawk in with my chickens if I didn't know what kind of hawk it was? I went online to ask professional bird-watchers to help me identify it. Their opinion is it is a young Brown Goshawk, not yet showing the usual markings. Brown Goshawks tend to hunt from a low, concealed perch. 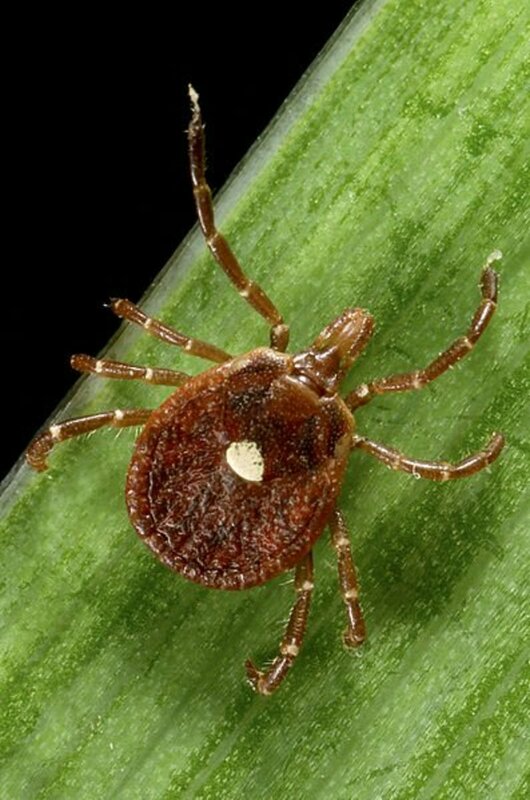 They pounce on their target using sudden, short bursts of speed — then reach out and strike with their long legs and clawed toes, before returning to their perch to partially pluck their prey before eating it. In theory, my chickens were in great danger. So how did they survive their close encounter with a Brown Goshawk? Our regular routine includes locking the gate into the chicken run after the chickens return to settle in their house for the night. Generally we lock the gate just before sunset. 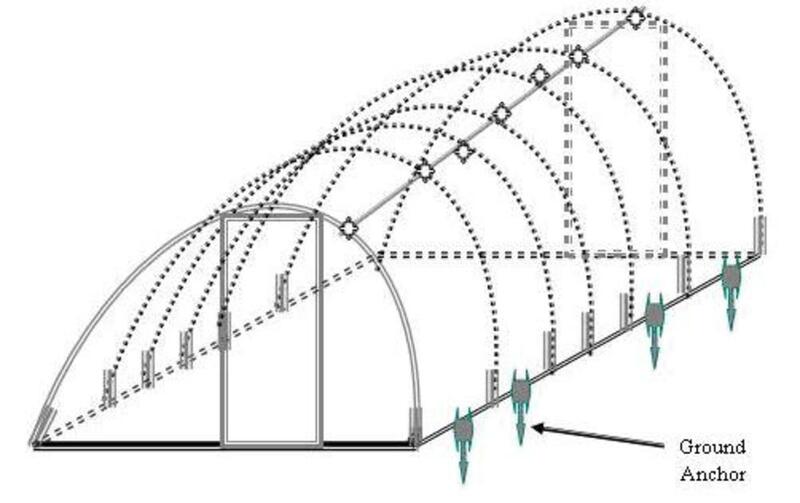 When designing the hen house, we positioned a window close to the gate. I can look through the window as I walk past and see the birds roosting. The window is on the western side of the building and the setting sun provides enough light for me to see inside. As luck would have it, we were out all afternoon and did not return home until quite late that evening. I locked the gate in the moonlight, without trying to look through the window. I assumed the poultry would be roosting inside their house. They were quiet and, I thought, happy. Had they been hiding beneath their house, I like to think I'd have spotted white feathers on some of my hens in the moonlight. I didn't, so I guess they'd made their way into the house. If the hawk was inside the chicken run when they returned home for the night, I'm guessing it must have been at the far end of the yard. Perhaps they slipped through the gate and up the ramp, protected from view by the large herbs and other plants growing in the middle of the chicken run. Or perhaps the hawk followed the last of the poultry through the gate, but failed to catch its prey ... suddenly finding itself in a strange environment. The gate was still open, providing an escape route, but either the hawk lost track of the gate or it decided to find a perch and wait for the birds to reappear. Even more surprising than the fact my poultry survived a night with a hawk locked in their yard is the fact they survived the next morning! I don't know where my poultry spent the night. I like to think they were safe and warm inside their house, with the hawk at the distant end of the chicken run. As I walked towards their yard area to let them out in the morning, I noticed they were grouped together beneath their house—a spot generally used during rain, not on a bright sunny morning. I didn't realize they were hiding from a hawk. Most mornings, the girls are spread throughout the run. The roosters share the large area without conflict, but without getting too close to each other; and any chicks small enough to slip through the fence are already out eating the grass. Without fail, there is always at least one or two hens taking dust baths in the far corner. For some reason, they prefer a spot with lots of twigs and bark mixed in with the dirt. Perhaps it is the eucalyptus smell they particularly like. The first thing I noticed was the entire tribe bunched under the building. 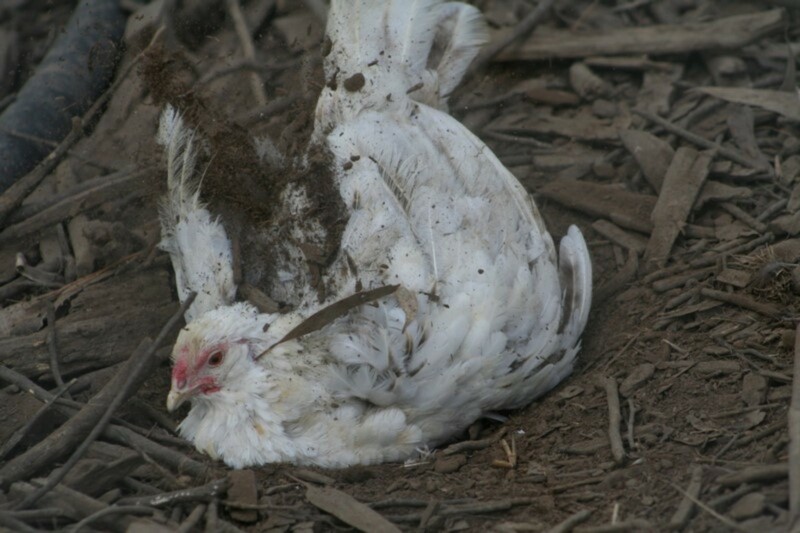 The second discrepancy to the morning routine was the absence of any hens wallowing in the dirt. As I opened their gate, they all raced past my feet. It was only when I walked past the tall herbs to see what might be at the far end of the run (suspecting perhaps a snake) that I spotted the Brown Goshawk perched directly above their dust bath. Clever chickens. They'd successfully been hiding from the hawk . . . and survived their night (and morning) up close and personal with a bird of prey! Living off the grid and attempting to build a sustainable lifestyle for my family has been an incredible learning experience. I approach each day and each task with a mental checklist. The most recent addition to my list of things to remember is to check for birds of prey in my chicken run before locking the gate at night! Mental note: Check for hawks. In the interests of keeping happy hens and a regular supply of fresh eggs, that doesn't seem too much to ask. I'm not sure how I'd cope with wildcats in my garden, John. Kangaroos and wombats only want to eat my grass, not my family or my animals. This was a very interesting account of how the chickens avoided an apocalypse. I live in Arizona and we have tons of vultures and different kinds of hawks. My 5 pound chihuahua is never left in the backyard unattended for this reason. We also can have an occasional wildcat walk the patio walls searching for a meal. Though vultures are not supposed to eat live meat, I cannot leave Minnie out alone. I am glad the chickens were able to huddle together and stay safe. This is a great story for anyone who keeps chickens. My little town has an ordinance against folks keeping them, but if I lived in the country I would certainly entertain housing a few for eggs. Good story! Hey, Jodah. Goannas used to steal eggs from our chook house when we lived in Queensland, but I hadn't seen a goanna at my new home until just the other day. Managed to get a photo of it with a really long lens. It had climbed a very tall tree, in the direction of a bird's nest I suspect. Could hear cheeping from way up high. Since my silkie rooster died a while back, I haven't bothered letting any of the small eggs hatch. 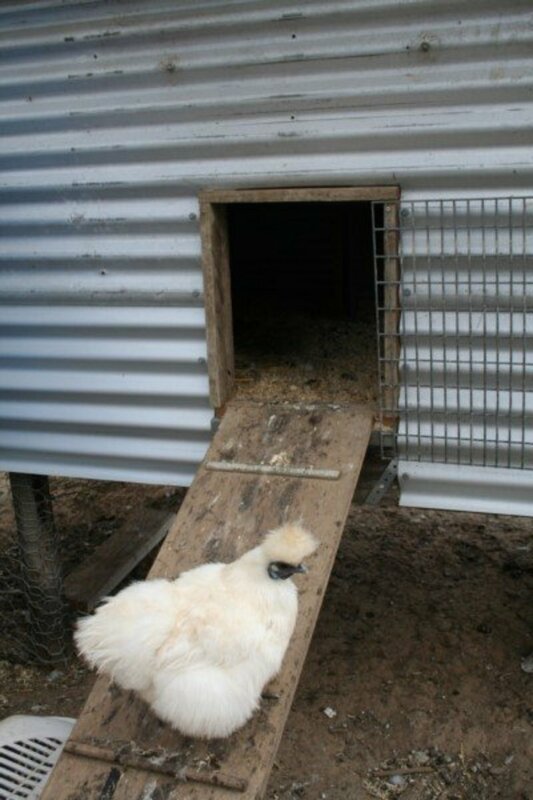 I like silkies to behave like silkies ... not fly high in the trees like offspring of my current rooster. Lucky for me, a local lady was selling silkie eggs so I currently have about a dozen underneath a clucky hen. More silkies soon, I hope! They are much better behaved in the vegetable garden than my other hens. I am late reading this LTM, but I don't seem to get notifications when you publish a hub, either that or they slip past me. I did enjoy this and it would have been an excellent addition to my "Diary of a Cackleberry Farmer" hubs. Interesting you posted a pic of one of your "silkies". When we lived up on the mountain at Bellthorpe, large white hawks (don't know the type) would swoop down and just pluck the heads off the silkies. This happened twice and prompted us to put a wire roof on the pen. I am glad your chooks survived the night with a goshawk. As you say it probably was out of it's comfort zone and couldn't attack from the ground. We haven't had problems with birds of prey where we are now, just carpet snakes and goannas, though other birds such as magpies, pigeons and apostle birds have been found locked in with the chicken at times. Our poultry free range most of the time and are only locked away at night, though usually try to keep new chicks locked up until they have gained a reasonable size because we do have cats, but the last lot were bantams and still weren't big after 6 weeks so I let them out anyway and the cats haven't touched them. Loved the photos too. thanks for sharing. If my chickens could talk, Marlene, they'd be telling the world what an idiot I am! Kookaburras would be laughing at me all day, every day. The only character more embarrassed than me in this tale would be the hawk ... so I'd love to read your interview with it! Thanks. Your chickens have a wonderful life. I sure wish those chicken could talk. And, I would love to get an interview with that hawk. lol. I don't know how hard the hawk tried to catch a feed, aviannovice. It felt too mean to leave them all in there together while I watched to find out. :) It was a happy outcome though. Thanks. Hi billybuc. I have a new respect for my feathered friends. They did well to survive such a challenge. lol. That was rather amazing. The hawk was pretty young, so I'm wondering if it was fully aware of where it was and the treasure trove of food. It certainly didn't try to hard to capture the chickens, fortunately. I'm glad that it ended well. I see hawks on occasion here in our area of the country. Once a huge one perched itself on our screen enclosure for most of the day. I hope it picked up one of those sneaky snakes! Great story and glad your chickens outsmarted the hawk. Blessings. A great story any chicken lover would appreciate. We have hawks circling our chicken every day...one landed on our deck...the chickens just ran under the house and stayed there until the coast was clear. Chickens are surprisingly smart when it comes to predators. Anyway, I'm glad to hear your flock is doing well. Bless their chicky heart for sticking together. Jackie asked about roosters and if mine were likely to have helped protect the chickens. Certainly, I've seen roosters round up hens and chicks for various reasons in the past. I used to have one lovely rooster who would never eat until all his girls were eating. He would get their attention and lead them to food on days when I kept them in their run. Years ago I had one rooster that was aggressive and would chase us, given the chance. He didn't last long. Wow, what an exciting story. It really is a miracle that they survived and like you said, a testimony to their cleverness. I love how you share you wisdom regarding living so close to nature. Very beautiful! Poor babies! What a scary night and morning that must've been. Thanks for sharing your story along with great photo's and information on birds. I had to hit every button and vote up. A very enjoyable read. We had free range chickens when I was a kid. They sometimes wanted to roost in the trees, but we tried to return them to their coop each evening so a coyote wouldn't get them. Wow, I've never heard of such lucky chickens. My grandparent's chicken coop was similar except that the chicken house was a walk in double room shed with a four tier roost in the front and four nest boxes in the back. 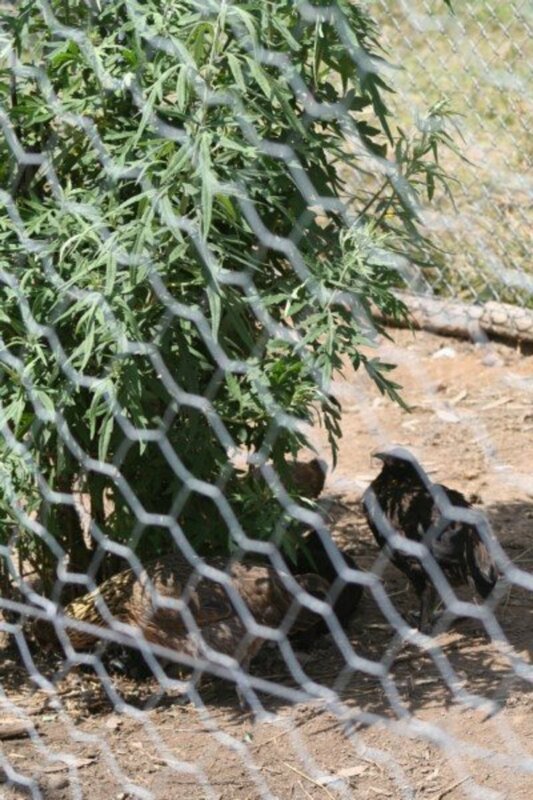 Don't think my grandmother knew about planting herbs in the chicken run. They never had flying predator trouble, just snakes and an occasional opossum. They lived in the East Texas Thicket. 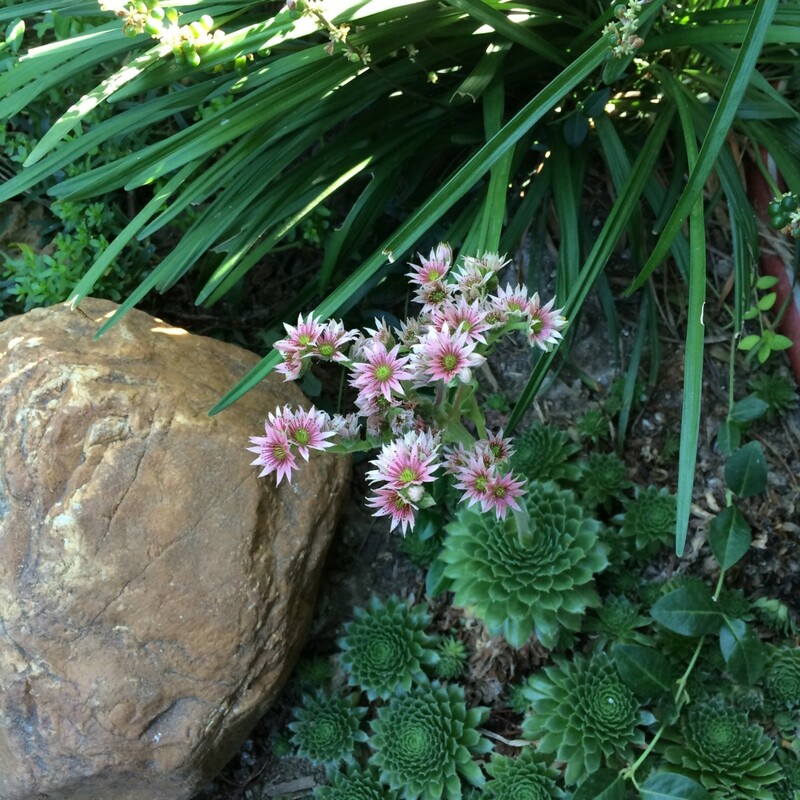 Glad to see your hens and chicks all survived. They were smart enough to hide from the hawk. I imagine how joyful they must have been when they reached to you quickly in the morning. Thanks for sharing it. Voted up. Sadly a possum just recently got two of my five hens. I was so relaxed with them seeming safe for so long I let down my guard over them and I hate it so bad. This is such an interesting article. My father raised chickens after he retired. Hi sallybea. I am a definite fan of majestic birds of prey. When I see them circling, I call my small dog inside but leave my free-range chickens to fend for themselves. I do occasionally lose one, although I've never actually seen one taken. Thanks Writer Fox. With the benefit of hindsight, I think I should have bought a lottery ticket. That was clearly my lucky day. lol. Amazing hub. Love the images. The Goshawk really is a very beautiful bird, especially when the wings are widespread. Thanks for sharing. Amazing pictures! I'm really surprised all the chickens survived, especially the babies. The hawk was probably so scared that he lost his appetite. Enjoyed!